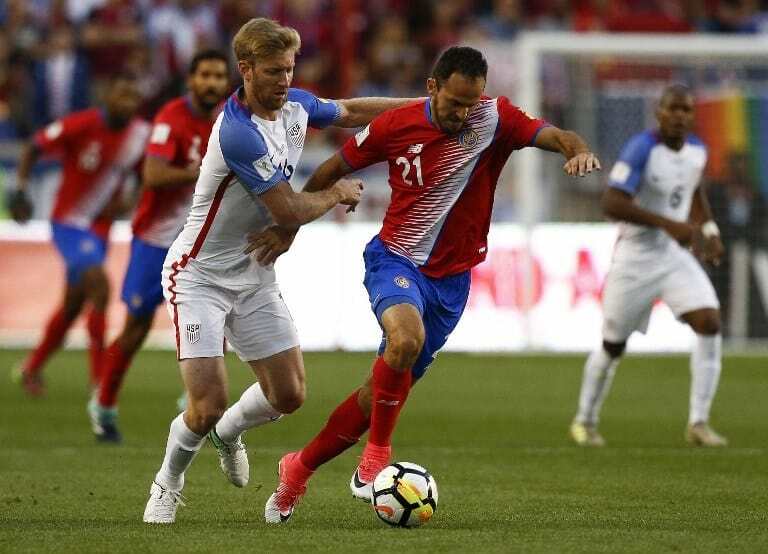 Costa Rican forward Marco Ureña brought an ecstatic grin to the faces of millions of Ticos Friday night with two goals against the United States in the final round of World Cup 2018 qualifying matches, also known as the Hexagonal. Ureña first scored in the 29th minute off a pass from team captain Bryan Ruíz, crossing the ball past veteran U.S. goalie Tim Howard. He followed up with a second goal in the 81st, converting a pass from David Guzmán. Star goalie Keylor Navas came up with some exciting saves on messy, nail-biting plays. During one U.S. attack in the 66th minute, he dove to the ground, then used an arm and leg to deflect a dangerous ball. In the 80th, he scooped up a ball at the feet of U.S. star Jozy Altidore. The U.S. maintained control of the ball throughout much of the game, but ultimately couldn’t convert on what became an outstanding night for La Sele. “We didn’t have a good night… they outplayed us,” U.S. coach Bruce Arena told reporters after the game. Next for La Sele: traditional nemesis Mexico, at the National Stadium in San José on September 5th. The United States will face off against Hondruas in San Pedro Sula the same day. Jamaica Part II: Will Costa Rica’s La Sele find its killer instinct?